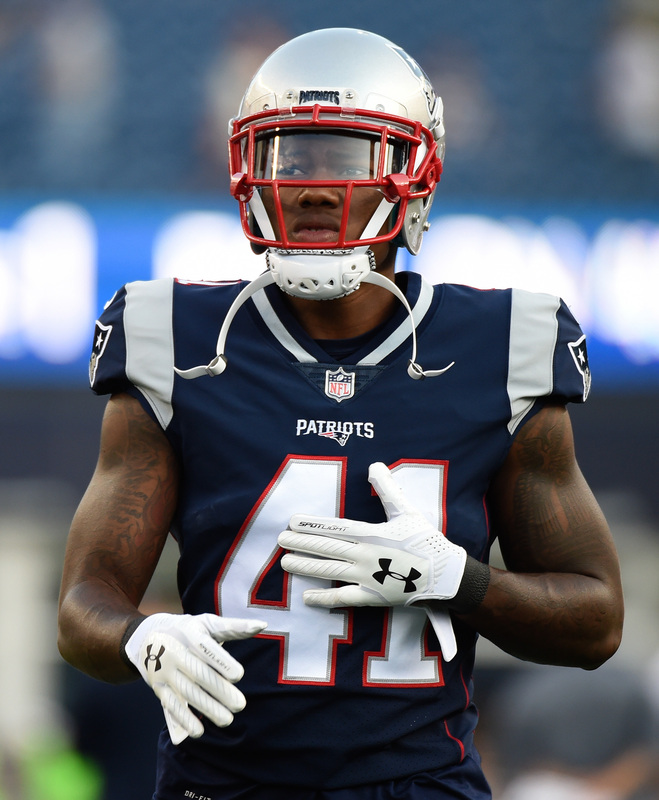 Patriots cornerback Cyrus Jones likely suffered a torn ACL in his right knee during their preseason finale against the Giants on Thursday, according to Jeff Howe of the Boston Herald. Jones will undergo an MRI on Friday. Having started in just one of 10 appearances and made seven tackles as a second-round rookie last year, the loss of Jones wouldn’t be an enormous blow to the Patriots’ defense. New England continues to boast Stephon Gilmore, Malcolm Butler, Eric Rowe and Justin Coleman as its top options at corner, leaving little room for Jones to make his mark defensively. On the other hand, Jones’ absence would negatively affect the Pats’ special teams unit and could influence how Bill Belichick constructs their roster prior to the cutdown deadline on Saturday. Jones was in line to serve as New England’s No. 1 return man on both kicks and punts prior to Thursday, and a serious injury to him (on top of Julian Edelman‘s) would leave the club without an obvious in-house solution, Doug Kyed of NESN writes. The 23-year-old Jones combined for 19 kick and punt returns last season. The NFL handed Cowboys star Ezekiel Elliott a six-game suspension stemming from domestic violence allegations earlier this month, but the league’s director of investigations, Kia Roberts, recommended no ban for the running back, Clarence Hill of the Fort Worth Star-Telegram reports. Roberts’ decision came after interviewing Tiffany Thompson, Elliott’s ex-girlfriend who accused him in June 2016 of committing physical violence against her on multiple occasions. Despite Roberts’ key role in the investigation, her suggestion didn’t make it into the NFL’s final report and its suspension letter, notes Hill. Further, Roberts wasn’t present during a commissioner Roger Goodell-led meeting that centered on potential disciplinary measures for Elliott, Hill adds. Senior vice president of investigations Lisa Friel was among those in attendance with Goodell, and it was Friel who advised a six-game suspension to the commissioner, according to Hill. The fact that Goodell ultimately did hand down that penalty to Elliott left Cowboys owner Jerry Jones “furious,” in part because he expected Elliott to elude punishment. A top official with the NFL informed Jones that the league would not discipline Elliott, Hill relays. Elliott appealed his suspension this week during a hearing that spanned three days and over 25 hours, and his side testified that Friel banned Roberts from the aforementioned meeting, Hill reports. Roberts, who was also on hand, testified Tuesday that she was the only league employee to interview Thompson, according to Dan Graziano of ESPN.com. Roberts also confirmed that she would not have recommended discipline for Elliott had she been part of the decision-making committee – one that Hill reports consisted of former New Jersey attorney general Peter Harvey, Pro Football Hall of Famer Ken Houston, chief executive of the Women of Color Network Inc. Tonya Lovelace and former U.S. attorney and ex-chair of the Securities and Exchange Commission Mary Jo White. Friel provided testimony on Wednesday and corroborated that of Roberts, Graziano writes. Hill contends the hearing went well for Elliott’s camp, noting that the league lacks solid proof that he abused Thompson. Both that and the NFL’s unwillingness to listen to Roberts would not bode well for the league in federal court, Hill posits. Elliott could file a lawsuit against the league if hearing officer Harold Henderson doesn’t overturn or reduce the suspension, and Graziano suggests that the NFLPA is ready to fight in court if necessary. Henderson is reportedly “under pressure” to make a decision by Monday. The Bills sent big-money defensive tackle Marcell Dareus home before their preseason game against the Ravens last week after he violated a team rule, leaving general manager Brandon Beane unsure if the two-time Pro Bowler is part of the solution. Asked this week if Dareus is on board with what the team is trying to build, Beane told Joe Buscaglia of WKBW (via Mark Inabinett of AL.com): “I don’t know. Time will tell. It was disappointing, as I said, after that game. He was contrite yesterday and said the right things. Actions speak louder than words. Time will tell. Hopefully, he is. We hope he’ll play to his potential. We know what kind of player he can be. We hope to see that on the field.” Even if the Bills are fed up with Dareus, who has multiple suspensions on his resume, moving on from the cornerstone defender in the near future would be extremely difficult because of the structure of his contract. The Bills inked Dareus to a six-year, $91.5MM extension in September 2015. The Steelers expect the NFL to fully reinstate wide receiver Martavis Bryant in advance of Week 1, GM Kevin Colbert told Ed Bouchette of the Pittsburgh-Post Gazette (Twitter link). The league suspended Bryant for all of last season for repeated violations of its substance abuse policy, conditionally reinstated the 25-year-old in April and gave him clearance to participate in the preseason three weeks ago. He hasn’t appeared in a meaningful game since a playoff loss to the Broncos on Jan. 17, 2016. Cornerback Joe Haden‘s $5.75MM signing bonus is the only guaranteed portion of the three-year, $27MM contract the Steelers gave him Wednesday, according to Dan Graziano of ESPN.com. The pact includes base salaries of $1.25MM, $9MM and $10MM, and it comes with a $1MM roster bonus that’s due in March 2018. Linebacker Vontaze Burfict‘s suspensions call his future with the Bengals into question, Katherine Terrell of ESPN.com observes. Burfict is set to serve a three-game ban for the second straight campaign, and he has only played 58 of a possible 80 regular-season contests in his five-year career. Cincinnati’s going to have to consider Burfict’s lack of availability when deciding whether to re-sign him by next winter, then. The same goes for tight end Tyler Eifert, whom injuries have limited to 37 of a possible 64 games during his four seasons. Both players make the Bengals better when they’re on the field, which Terrell notes will make for tough decisions in each case. 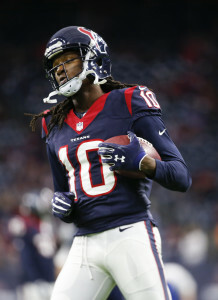 The Texans have agreed to a five-year contract extension with wide receiver DeAndre Hopkins, according to ESPN’s Adam Schefter (Twitter link). It’s a five-year, $81MM pact, Ian Rapoport and James Palmer of NFL.com report, while Schefter adds that it includes $49MM in guarantees (Twitter links). Both the total value of the contract and the guaranteed amount place Hopkins atop the NFL at his position, moving him above Atlanta’s Julio Jones ($71.25MM and $47MM, respectively). Thursday has been an extremely busy day for Texans general manager Rick Smith, who has agreed to extensions with Hopkins, safety Andre Hal, tight end C.J. Fiedorowicz and fullback Jay Prosch over the past few hours. The crown jewel of the quartet is undoubtedly Hopkins, a bona fide star who has provided exceptional production despite having to play with a slew of mediocre-at-best quarterbacks during his four-year career. Most recently, Hopkins racked up 78 receptions for 954 yards and four touchdowns during a 16-start 2016. While most wideouts could only hope to post that type of output, it was actually disappointing coming from Hopkins, who didn’t benefit from now-Browns quarterback Brock Osweiler‘s presence in Houston. New starter Tom Savage earned Hopkins’ endorsement earlier this summer, and now the 25-year-old target will attempt to return to his pre-2016 form with Osweiler gone. The 27th overall pick out of Clemson in 2013, Hopkins hasn’t missed a game and has already piled up 317 receptions, 4,487 yards (14.2 YPC) and 23 scores in his Houston tenure. During his career year, 2015, Hopkins wowed with 111 grabs, 1,521 yards and 11 TDs en route to second-team All-Pro honors and his sole Pro Bowl nod. Hopkins held out in search of a raise the ensuing summer, but his absence only lasted one day. There hadn’t been any acrimony between the sides between last July and Thursday, though. Hopkins made it clear on multiple occasions over the past year that he wanted to remain a Texan for the long haul, and both Smith and owner Bob McNair expressed similar sentiments. The Texans have agreed to a three-year contract extension with tight end C.J. Fiedorowicz, according to Adam Schefter of ESPN (on Twitter). The deal, which runs through 2020, is worth $22MM and includes $10.1MM in guarantees, Ian Rapoport of NFL.com tweets. 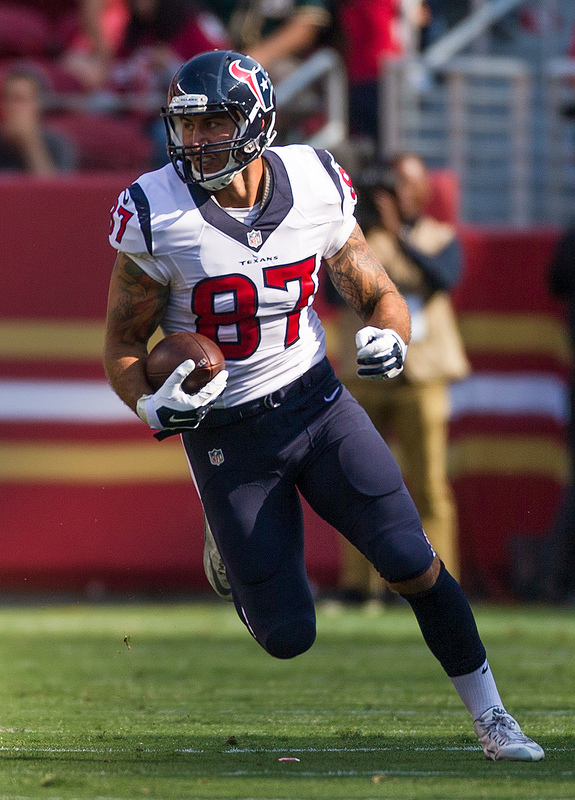 Fiedorowicz now ranks 14th among tight ends in total contract value, ninth in yearly average and 17th in guarantees. This has been an extension-happy day for the Texans, who locked up safety Andre Hal and fullback Jay Prosch to long-term pacts in the afternoon. Fiedorowicz is arguably the highest-profile player of the trio, having broken out as a third-year man in 2016 with 54 receptions, 554 yards and four touchdowns on 89 targets. The 25-year-old also started in all 15 of his appearances, building on a 14-start campaign in 2015. In all, the former Iowa Hawkeye has logged 37 starts in 46 games and hauled in 75 catches, 754 yards and six scores since going to the Texans in the third round of the 2014 draft. Between Fiedorowicz and Ryan Griffin, who amassed 50 receptions last season, the Texans possess one of the most prolific pass-catching tight end tandems in the league. Griffin is under contract through 2019 on the three-year, $9MM extension he signed in March, meaning the club will have the duo around for the foreseeable future. Aaron Wilson of the Houston Chronicle first reported that the two sides were nearing a deal. Photo courtesy of USA Today Sports Images. The Texans have signed fullback Jay Prosch to a three-year, $5.75MM contract extension, ESPN’s Adam Schefter tweets. The deal includes $2.7MM in guarantees. 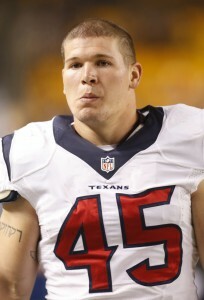 Prosch, who was entering the last year of his contract prior to the extension, has spent his entire career in Houston since the team selected the former Auburn Tiger in the sixth round of the 2014 draft. He appeared in all but one of 48 possible regular-season games during his first three years, though he hasn’t been a significant factor on offense. Thus far, the 25-year-old Prosch has started in eight games and totaled 12 touches (10 carries, two receptions). While Prosch hasn’t made a name for himself offensively, he has been a reliable special teamer for the Texans. Prosch’s work with that unit has increased each season, as his ST snaps went from 109 to 208 to 220 during his first three years in the league. Prosch saw the fifth-most action of any of Houston’s special teamers in 2016, though Football Outsiders ranked its ST unit as the NFL’s second worst. The 49ers have been a mess since Jim Harbaugh left for Michigan following the 2014 campaign, but the club is perhaps finally getting back on track. With a new general manager and head coach in place, San Francisco spent the offseason rebuilding from the ground up. Pierre Garcon, WR: Five years, $47.5MM. $17MM guaranteed. Malcolm Smith, LB: Five years, $26.5MM. $11.5MM guaranteed. Brian Hoyer, QB: Two years, $12MM. $9.85MM guaranteed. $6.5MM available via incentives. Kyle Juszczyk, FB: Four years, $21MM. $7MM guaranteed. Earl Mitchell, DT: Four years, $16MM. $4.65MM guaranteed. 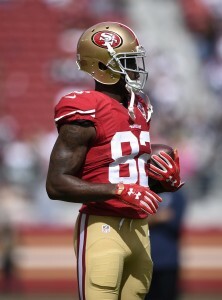 Marquise Goodwin, WR: Two years, $6MM. $4.45MM guaranteed. Jeremy Kerley, WR: Three years, $8.4MM. $2.8MM guaranteed. Elvis Dumervil, DE: Two years, $8MM. $1.5MM guaranteed. Garry Gilliam, T: One year, $2.2MM. $1.25MM guaranteed. Seahawks declined to match 49ers RFA offer sheet. Dekoda Watson, LB: Three years, $4.5MM. $1MM guaranteed. Robbie Gould, K: Two years, $4MM. $1MM guaranteed. Don Jones, S: Two years, $2.2MM. $750K guaranteed. Matt Barkley, QB: Two years, $4MM. $500K guaranteed. Aldrick Robinson, WR: Two years, $4MM. $500K guaranteed. $2MM available via incentives. Brock Coyle, LB: One year, $1.45MM. $400K guaranteed. Tim Hightower, RB: One year, $1.107MM. $300K guaranteed. $400K available via incentives. Logan Paulsen, TE: One year, $1MM. $125K guaranteed. K’Waun Williams, CB: One year, $765K. $75K guaranteed. $250K available via incentives. Chris Jones, DT: One year, minimum salary benefit. $50K guaranteed. Tim Barnes, C: One year, $795K. $20K guaranteed. Brandon Fusco, G: One year, $1.4MM. Shayne Skov, LB: One year, $615K. 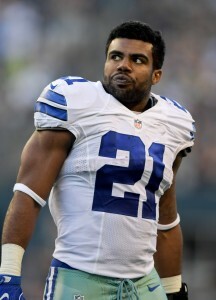 Will Davis, CB: One year, minimum salary benefit. Leger Douzable, DT: One year, minimum salary benefit. Andrew Gardner, OL: One year, minimum salary benefit. Asa Jackson, CB: One year, minimum salary benefit. Sen’Derrick Marks, DT: One year, minimum salary benefit. Louis Murphy, WR: One year, minimum salary benefit. With a new regime lead by head coach/offensive mastermind Kyle Shanahan in place, the 49ers nearly revamped the entirety of their offensive skill positions during the free agent period. That effort started with the signings of quarterbacks Brian Hoyer and Matt Barkley, who will likely serve as San Francisco’s No. 1 and No. 2 options under center in 2017. The 49ers figure to target a signal-caller upgrade in the coming year, either through an early draft choice or a pursuit of a free agent quarterback such as Kirk Cousins, but a Hoyer/Barkley tandem is a serviceable duo for a rebuilding club, especially given the limited price tag. Hoyer, of course, has worked with Shanahan before, passing for more than 3,000 yards, 12 touchdowns, and 13 interceptions under the then-Browns play-caller in 2014. While the 31-year-old performed much better in 2016 (no interceptions on 200 pass attempts), Hoyer finished 26th in air yards per attempt among quarterbacks with at least five starts, meaning his success was mostly based around short throws. Hoyer will be tossing the ball to a wide receiver crew that’s almost entirely new, and is now led by Pierre Garcon. Like Hoyer, Garcon has played for Shanahan in the past, as he lead the NFL in receptions with the Redskins in 2013 while Shanahan was the club’s offensive coordinator. While Garcon may not be a clear-cut No. 1 wideout any more at the age of 31, he’ll serve in that capacity for the 49ers, especially given that he’s familiar with the team’s new offensive scheme. It won’t be a surprise if he improves upon his 114 targets from a season ago, and the club will value his leadership and toughness. San Francisco didn’t stop after adding Garcon, however, as the club also signed Marquise Goodwin, Aldrick Robinson, and Louis Murphy while re-upping Jeremy Kerley. Goodwin is the most intriguing of the bunch, as he’s a former Olympian who ran a 4.27-second 40-yard dash at the 2013 combine. Ideally, that would make Goodwin a near-perfect option to play the Taylor Gabriel/deep threat role in Shanahan’s offense. San Francisco’s backfield also saw a makeover headlined by the additions of running back Tim Hightower and fullback Kyle Juszczyk. Hightower is 31 years old, but he doesn’t have the wear-and-tear of a normal running back of that age given that he didn’t play in the NFL from 2012-14 (all told, he’s only rushed 752 times during his pro career). While he should be able to help in the passing game, Hightower could have trouble running behind the 49ers’ sub-par offensive line — according to the 2017 Football Outsiders Almanac, Hightower broke a tackle on only 7.8% of his touches, second-worst in the league. Juszczyk, meanwhile, signed one of the more above-market deals in recent memory, as he blew away all fullback precedents with a $5.25MM annual salary that is more than double the next fullback. The deal is a complete overpay, but Shanahan knows how to deploy fullbacks (see: Patrick DiMarco in 2016), and San Francisco had cap space to burn. The 49ers used that ample cap space to ink a number of veterans to low-cost contracts (whether that be minimum salary benefit deals or just pacts with little-to-no guaranteed money). Never was that more apparent that along the offensive line, where San Francisco signed Tim Barnes, Brandon Fusco, Andrew Gardner, and Garry Gilliam, the latter of whom was poached from the division-rival Seahawks in restricted free agency. None of those players is a superstar, and they may not all even make the Niners’ 53-man roster. But they’ll give the club some semblance of respectability up front — Fusco, notably, is now on track to start at right guard while Barnes could conceivably see time at center in place of Daniel Kilgore. Barnes, Fusco, and Gilliam combined to start 43 games in 2016. Taking chances on cheap players was also a tactic for San Francisco on the defensive side of the ball (cornerback K’Waun Williams, defensive linemen Chris Jones and Leger Douzable), but the club also brought in a number of defenders who should definitely stick on the roster. The 49ers’ defensive line was specifically addressed, as the team signed defensive tackles Earl Mitchell and Sen’Derrick Marks plus edge rusher Elvis Dumervil. Mitchell should anchor the interior of San Francisco’s defensive front, playing the nose tackle role alongside three-technique DeForest Buckner, while Marks can offer a bit of pass rush on an interior rotation. 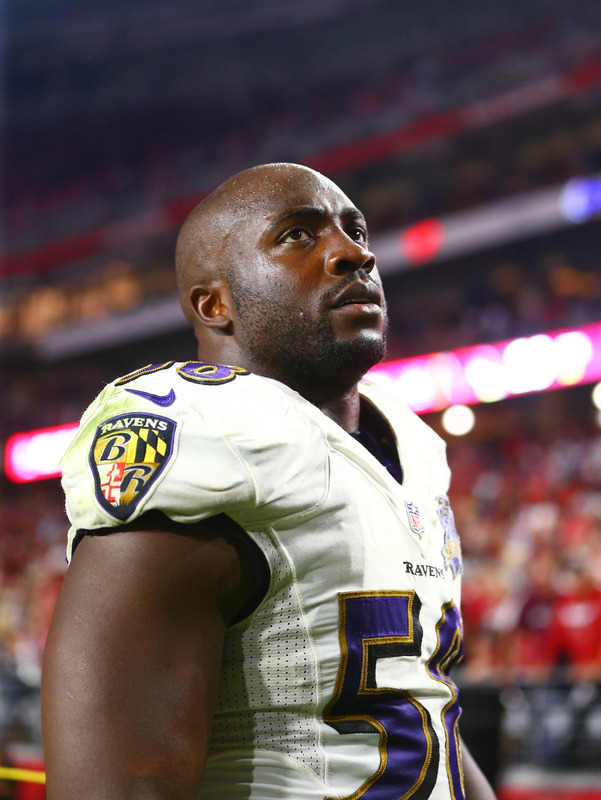 Dumervil, though, is potentially the most interesting addition, as the 33-year-old came on in 2016 after returning from a foot injury — in the last five weeks of the season, Dumervil managed 22 total pressures (sixth among edge defenders), per Pro Football Focus. A multitude of new offensive players in San Francisco meant the club needed to cut ties with a number of incumbents, and that list starts with quarterbacks Colin Kaepernick and Blaine Gabbert. We’re not going rehash Kaepernick’s entire history of social activism and his decision to kneel for the national anthem in 2016, as there’s no indication either ultimately led to him leaving the 49ers. Kaepernick made the decision to opt out of his contract after it was clear general manager John Lynch & Co. would release him if he didn’t do so, a call that was mostly performance- and salary-based. Once San Francisco made the decision to pursue Brian Hoyer, it simply didn’t make sense to retain Kaepernick and his nearly $15MM cap charge. Gabbert, too, wasn’t asked to return after completing only 57% of his passes in five starts. The turnover continued at the skill positions, where running back Shaun Draughn and wide receivers Torrey Smith, Quinton Patton, Bruce Ellington, and Rod Streater are now gone. Patton led that group in offensive snaps (701), but he only managed 37 receptions and a 58.7% catch rate. Smith performed even worse (just 20 catches), and was subsequently released following two disastrous years in the Bay Area. Signed to a five-year, $40MM deal prior to the 2015 campaign, Smith never found a place in the 49ers’ offense, averaging only 26 receptions per season while scoring just seven total touchdowns (he scored 11 times in 2014, his final campaign in Baltimore). Draughn, meanwhile, has always been a reliable receiving back, but that’s a role that will taken by Tim Hightower and/or Matt Breida in 2017. 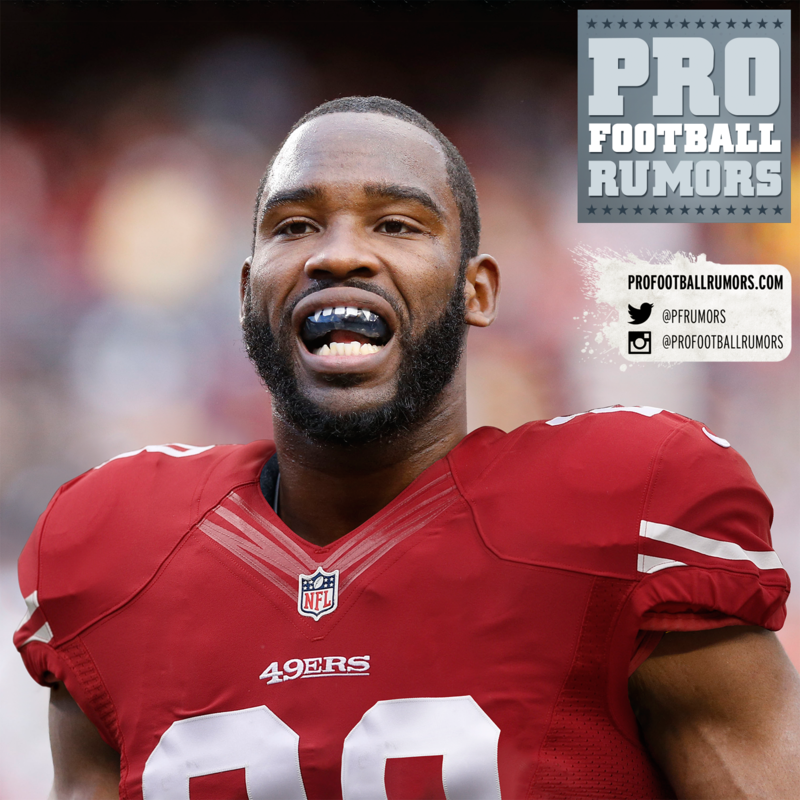 On the defensive side of the ball, the 49ers cut bait with a cadre of linebackers: Ahmad Brooks, Gerald Hodges, Michael Wilhoite, and Nick Bellore were all either released or allowed to leave via free agency. Brooks was cut over the weekend in a move that made sense for multiple reasons, namely Brooks’ age (33) and the fact that he hasn’t ranked as a top-20 edge option per PFF since 2012. A case could be made that San Francisco should have made more of an effort to retain either Hodges or Bellore, as both landed only minimum salary contracts this offseason. Hodges is only 26 years old and was excellent on 583 defensive snaps last season, while Bellore is a standout special teams player. Changes also came to the 49ers’ secondary, where the club parted ways with cornerback Tramaine Brock following domestic violence allegations. Brock eventually saw his charges dropped, but San Francisco — which was reportedly interested in extending Brock before the claims surfaced — had already released him. While the Niners may have acted too quickly, it’s difficult to judge their decision to cut Brock given the current climate regarding domestic violence. Safety Antoine Bethea is also gone (and, like Brock, is now playing for another NFC West team), but his release was performance-based, as PFF graded him as a the league’s No. 74 safety among 90 qualifiers. Acquired C Jeremy Zuttah and a 2017 sixth-round pick (No. 198) from the Ravens in exchange for a 2017 sixth-round pick (No. 186). Acquired a 2017 first-round pick (No. 3; DL Solomon Thomas), a 2017 third-round pick (No. 67), a 2017 fourth-round pick (No. 111), and a 2018 third-round pick from the Bears in exchange for a 2017 first-round pick (No. 2; QB Mitch Trubisky). Acquired a 2017 first-round pick (No. 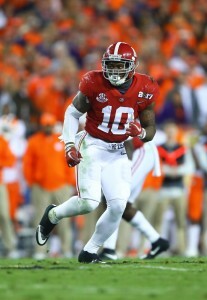 31; LB Reuben Foster) from the Seahawks in exchange for a 2017 second-round pick (No. 34) and a 2017 fourth-round pick (No. 111; S Tedric Thompson). Acquired a 2017 seventh-round pick (No. 229; CB Adrian Colbert) and a 2018 second-round pick from the Saints in exchange for a 2017 third-round pick (No. 67; RB Alvin Kamara). Acquired a 2017 third-round pick (No. 104; QB C.J. Beathard) from the Vikings in exchange for a 2017 fourth-round pick (No. 109; DT Jaleel Johnson) and a 2017 seventh-round pick (No. 219; WR Stacy Coley). Acquired RB Kapri Bibbs and a 2017 fifth-round pick (No. 177; WR Trent Taylor) from the Broncos in exchange for a 2018 fourth-round pick. Acquired a 2017 fourth-round pick (No. 121; RB Joe Williams) from the Colts in exchange for a 2017 fourth-round pick (No. 143; RB Marlon Mack) and a 2017 fifth-round pick (No. 161; LB Anthony Walker). Acquired a 2018 fourth-round pick from the Steelers in exchange for TE Vance McDonald and a 2018 fifth-round pick. Acquired G Laken Tomlinson from the Lions in exchange for a 2019 fifth-round pick. While the 49ers’ trade for center Jeremy Zuttah now looks confusing given that the club has already released him (paving the way for Zuttah to re-sign with Baltimore), the deal had merits at the time it was agreed to. San Francisco was hoping to improve upon Daniel Kilgore, whom PFF ranked as the league’s No. 27 center a season ago, by acquiring Zuttah, whom PFF listed at No. 17. It’s a small separation, to be sure, but the Niners didn’t give up much, as they only dropped down 12 spots in the sixth round to pick up Zuttah. Sure, the deal didn’t work out, but it barely cost San Francisco anything and represented a worthwhile risk. 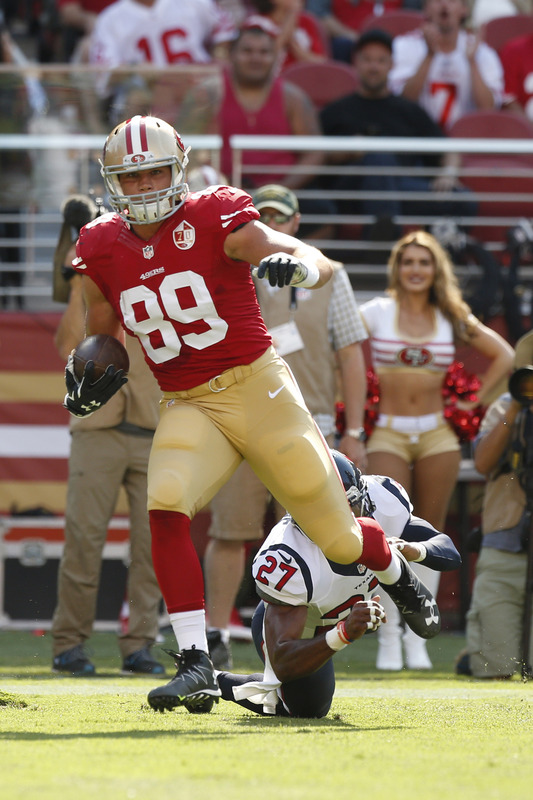 The Niners were on the other end of a small draft drop in the Vance McDonald trade, as they sent the veteran tight end and a fifth-round pick to the Steelers for a fourth-round choice. Pittsburgh, of course, projects to perform well next season, so its fourth-rounder will likely come near the end of the round, while San Francisco’s fifth-round selection should be at the top of the round. As such, the 49ers may only move up ~10 places in exchange for giving up McDonald, but that’s probably acceptable for the clubs’ new front office, which has been trying to trade McDonald for some time. San Francisco will take on dead money for McDonald in each of the next two years: $1.4MM in 2017 and $4.2MM in 2018. Through the McDonald trade, San Francisco will recoup the 2018 fourth-round pick it lost as part of the Kapri Bibbs draft-day swap. The Bibbs deal was a strange one from the beginning, as the 49ers gave up a relatively high draft choice next year in exchange for a running back who boasts all of 29 career carries. Perhaps general manager John Lynch & Co. saw an opportunity to add a special teams contributor on the cheap, as Bibbs played on 43.8% of Denver’s special teams snaps in 2016. But given the presence of Tim Hightower, Joe Williams, Matt Breida, and Raheem Mostert, Bibbs isn’t even likely to make the final San Francisco roster. That’s not the case for former first-round pick Laken Tomlinson, whom the 49ers picked up from the Lions on Thursday. While Tomlinson has started 24 games over his first two years in the NFL, he’s also performed like one of the league’s worst guards. He wasn’t going to earn a roster spot with Detroit, so Lions general manager Bob Quinn did well to get any sort of compensation for him. But that doesn’t mean the deal doesn’t have merit for San Francisco, as well, as taking chances on players with pedigree is always a tenable strategy for rebuilding clubs. It’s still unclear whether the 49ers actually had other suitors other than the Bears for the No. 2 pick and quarterback Mitch Trubisky, as various reports offered conflicting information. Either way, San Francisco clearly made Chicago believe the second overall selection was in high demand, and the 49ers ultimately collected 154 cents on the dollar (with their 2018 pick acquisition discounted 10% because it’s a future selection) and still came away with one of the draft’s best defensive players in Stanford’s Solomon Thomas. Thomas, who is expected to start immediately in the 49ers’ new 4-3 scheme, led all draft-eligible defenders in Pro Football Focus‘ run defense grading, and also registered a quarterback pressure on one-out-of-ten pass rushing snaps, third in the class. San Francisco would’ve selected linebacker Reuben Foster third overall had Myles Garrett and Thomas already been off the board, but the team eventually got the Alabama defender after trading back into the first round at No. 31. First-year general manager John Lynch may have avoided a critical mistake with Foster, as drafting a player that eventually fell to the end of Day 1 at No. 3 overall would have been a clear error. But that doesn’t mean the 49ers didn’t land an excellent player, and one who’s expected to start now that he’s medically cleared and fellow ‘backer Malcolm Smith is lost for the season. Lance Zierlein of NFL.com says Foster has an “alpha mentality” and compares him to the Seahawks’ Bobby Wagner. Other 49ers draftees have a chance to make an early-season impact, as well. Fifth-rounder George Kittle, specifically, looks like the club’s starting tight end after the trade of veteran Vance McDonald. Trent Taylor will be an immediate option in the return game, and could see snaps in the slot if Jeremy Kerley falters. Running back Joe Williams is currently behind undrafted rookie Matt Breida and journeyman Raheem Mostert, but the Utah Ute was especially explosive at the combine. Quarterback C.J. Beathard, meanwhile, was considered an overdraft in the third round, but he might be able to beat out Matt Barkley for San Francisco’s backup signal-caller job. Hired John Lynch as general manager to replace Trent Baalke. Hired Kyle Shanahan as head coach to replace Chip Kelly. Hired Robert Saleh as defensive coordinator to replace Jim O’Neil. Hired Richard Hightower as special teams coordinator to replace Derius Swinton. Exercised 2018 fifth-year option for CB Jimmie Ward ($8.526MM). Learned LB Malcolm Smith would miss the 2017 season (torn pectoral). Signed 16 undrafted rookie free agents. The 49ers are now on their fourth head coach in as many seasons, and this time around first-time head coach Kyle Shanahan will be joined by another first-timer in general manager John Lynch. San Francisco shocked the NFL world by hiring Lynch, a former player and broadcaster, but the club should be given credit for thinking outside of the box. If the early returns are any indication, Lynch is cut out to be an NFL GM, especially with talent evaluators such as former Broncos staffer Adam Peters by his side. Shanahan, meanwhile, is widely respected around the league for his offensive calls and innovation (his efforts at the end of Super Bowl LI not withstanding), and he should be able to get the most out of what is currently an underwhelming set of offensive skill position players. His staff is certainly short on experience, however, as none of the San Francisco coaches have ever been a head coach or even a coordinator before. The 49ers won’t hire an offensive coordinator, and Shanahan will lean on a quarterbacks coach in Rich Scangarello who most recently worked at Wagner College, a liberal arts university in New York. Could the 49ers be an extremely under-the-radar playoff sleeper in 2017? That’s probably too much to ask just yet, but the club has added enough baseline talent that two wins shouldn’t be the expectation again. While the rebuild in San Francisco could be a slow process (at least until the team finds it long-term quarterback), the 49ers should take a step forward next season. Information from Over the Cap and Roster Resource was used in the creation of this post. Photos courtesy of USA Today Sports Images. The Chiefs have released offensive lineman Jah Reid, according to Terez A. Paylor of the Kansas City Star (Twitter link). The 29-year-old Reid became expendable with the addition of fellow O-lineman Cameron Erving, whom the Chiefs acquired from the Browns on Wednesday. 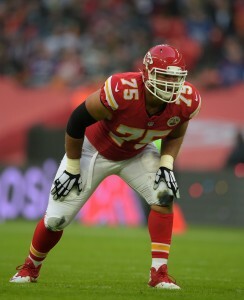 Reid, a six-year veteran who has been a Raven for the majority of his career, spent the previous two seasons with the Chiefs and started in 11 of 22 appearances while playing both tackle and guard. He came off the bench in all but one of his 12 games last season and earned a less-than-stellar performance review from Pro Football Focus. Releasing Reid saves the Chiefs $2.78MM of his $3.56MM cap number this season. Reid was under contract through next year via the extension he signed late in 2015, so cutting him also frees up $3.2MM in 2018 (against $775K in dead money). On the field, Reid’s exit leaves Erving as the top backup to starting tackles Eric Fisher and Mitchell Schwartz, while Isaiah Battle and Jordan Devey represent a couple of the Chiefs’ other bookend options. Greg Olsen still doesn’t have that new deal he was looking for, but he has been given some extra motivation with two years to go on his current pact. The Panthers have added $2MM in incentives to his contract, Adam Schefter of ESPN.com (on Twitter) has learned. The bonuses will be tied to catches, receiving yards, average yards per catch, and other honors, Ian Rapoport of NFL.com (Twitter link) adds. Olsen now has the ability to earn $8.75MM in total this year. Olsen was pushing the Panthers for a revamped deal earlier this offseason and it was even intimated that he could hold out from training camp. However, he backed down from those demands after the team fired GM Dave Gettleman. Citing a desire to keep the team distraction-free, he said that he would play out the remainder of his contract under interim GM Marty Hurney. 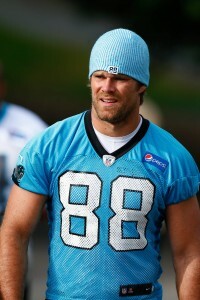 The tight end hasn’t missed a game during his six years with the Panthers, and he has averaged 71 catches, 897 yards and five touchdowns per season with the club. 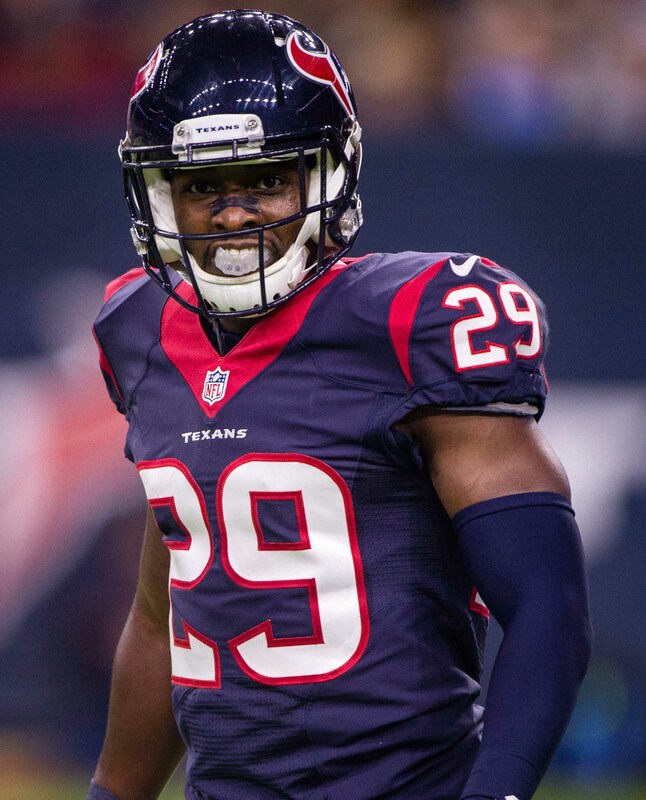 The Texans and safety Andre Hal have agreed to a contract extension, Mark Berman of FOX 26 tweets. It’s a three-year, $15MM deal with $7MM guaranteed, Aaron Wilson of The Houston Chronicle adds (on Twitter). Hal’s previous deal was slated to expire after carrying a $1.8MM cap number in 2017. The new agreement is more appropriate for him since he has started in 22 of his 31 games over the last two seasons. Last year, Hal finished out with 46 tackles, two interceptions, and a sack. In ’15, he had a career high four picks. For what it’s worth, the advanced metrics at Pro Football Focus weren’t crazy about Hal last year, placing him as just the No. 60 safety in the NFL out of 90 qualified players. However, he did score higher than notables like Tyrann Mathieu and T.J. McDonald. Hal will be the Texans’ top free safety this year with Corey Moore starting at strong safety.